MDS made it so easy. I had this on the front and on the back I had their contact information in case they lost their bag. As some of you know I am in Orlando this week having a great time with my Wagstampers team members. We always give roomie gifts. 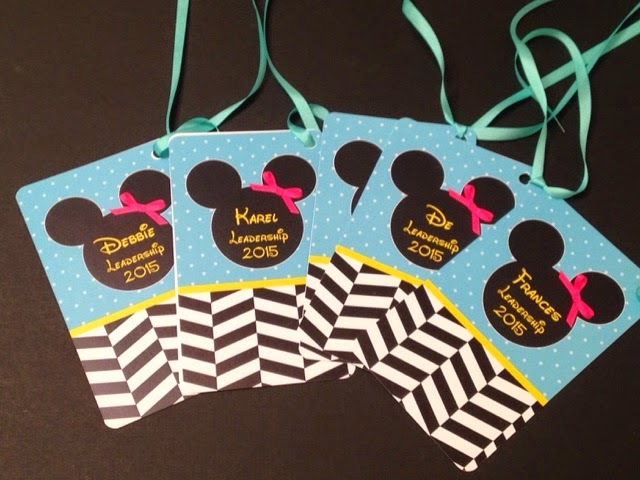 I decided to make bag tags for my gift. By the way did you see this over the moon cute cute bag they gave us. It is reversible and I will take a picture of the other side when I get home. Today is the day!!! I am on my way to Orlando for the annual Leadership Conference!!! I can't wait to share all the new ideas with you. I have my swap cards ready, some of my team members are traveling from North Carolina and I can't wait to see them. Below is my February Calendar of events. Sign up today to reserve your seat and drop a check in the mail to confirm. I also have to order supplies for some of these classes in advance. It's so simple... with any $75 order while I'm away at Leadership (January 28-Feb1), I will send you a package Blendabilities Markers of your choice in the annual Stampin’ UP! catalog!! (pg 212, $11.95 packs only !!). That's it! After you place your $75 order (before shipping and tax) HERE, just email me (wagstamps@yahoo.com) and let me know which pack you'd like! Remember to check out the Weekly Deals and Clearance Rack for great deals and don't forget for each $50 you spend you get a free Sale a Bration item. 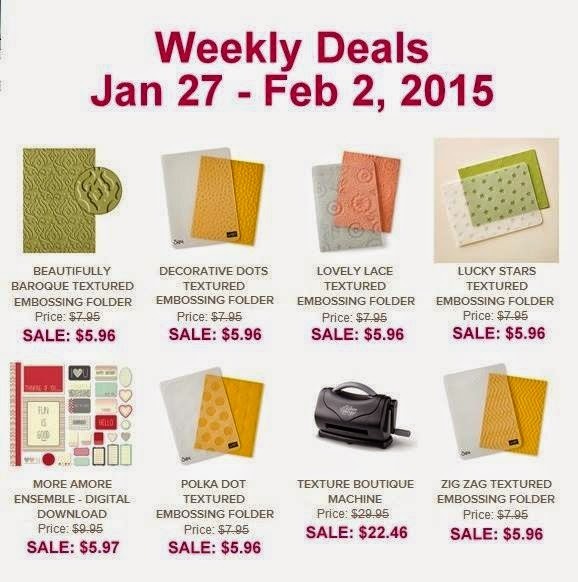 If you love embossing folders this is a great week to add to your stash. Labels: Frances Wagner, Leadership Conference Special, Stampin' Up! Have you paid attention to this really cute stamp set? From the Herd!!! Love it. I was playing around last night and came up with these two cards. If you know me you probably know that coloring in is not my strong point! :) So this is my alternative. I stamped twice, once on whisper white card stock and once on the Stacked With Love DSP paper stack. (small hearts) Then I cut out the goat and and attached to the white piece of stamped card stock. It sort of looks like he has the measles :), don't you think? Then I just added a touch of color here and there. It works for me. I think he is adorable. I just wanted to show you how it looks up close. Labels: Frances Wagner, From the Herd., Stampin' Up! Check out the weekly deals! 25% off!!! While supplies last. What a fun time we had this month at stamp club! I thought I would share what projects we made. If you would like to have 5 of your friends over and stamp together each month and the 6 of you take turn being the hostess let me know. We always make 3 projects. Don't you "LOVE" the "FREE" Best Year Ever Designer Series Paper from out Sale a Bration Catalog below! What about that cute bow. It is so easy to make with the new Bow Builder Punch. Who doesn't like Valentines Day! I love the new Stacked With Love paper pack. Black designs on one side and real red on the other. Yes it screams valentines. Have you seen the NEW cute Snuggles and Smooches Photopolymer set? Check out the set below. Last but not least the fabulous Butterfly Framelit Die. You have to love it. 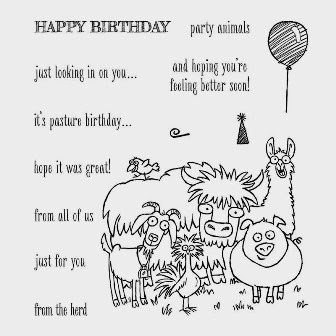 I cased this card from Deb Valder. Hers is a tad different. So if you want to meet with your friends and play with stamps let me know. You are not going to want to miss this!!! 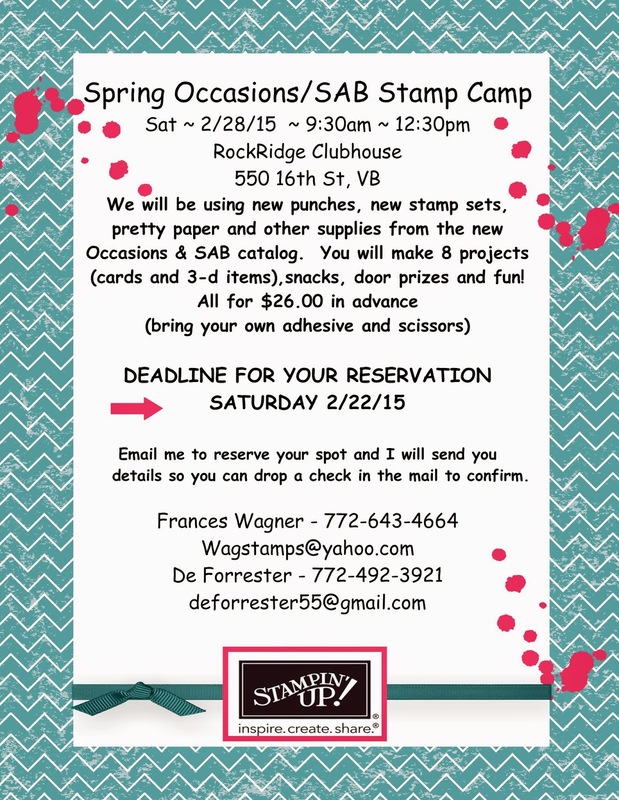 Sign up today for this fun Stamp Camp we will be using all new products from the Spring Occasions and the Sale a Bration catalogs! (ie. papers, stamps, big shot dies and punches). 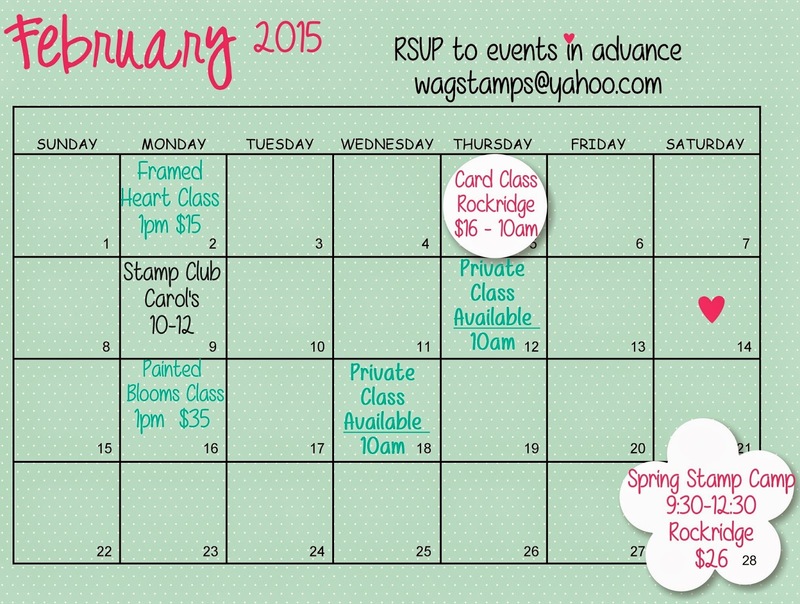 Deadline to sign up is 2/22/15 ~ after 2/22/15 late sign ups fee is $30 for Stamp Camp. De and I are working on your fabulous projects. Email me today to register and I will send you the address to mail your check. Last weekend I went to a vintage show and loved everything but only came home with this sweet chalk-Clip Board. I forgot to take a picture before I wrote my message but I need it for this weekend for the Salvation Army Crop. It was cute and for $3.00 I could not buy a clipboard and the paint and do it myself for that price so I bought it. I also tried the flower on the middle. I started with coffee filters and misted them with rubbing alcohol and Strawberry Slush reinker; let it dry; and cut them out using the Bouquet Bigz L Die and used hot glue to put them together and then attached to clipboard with dimensionals. 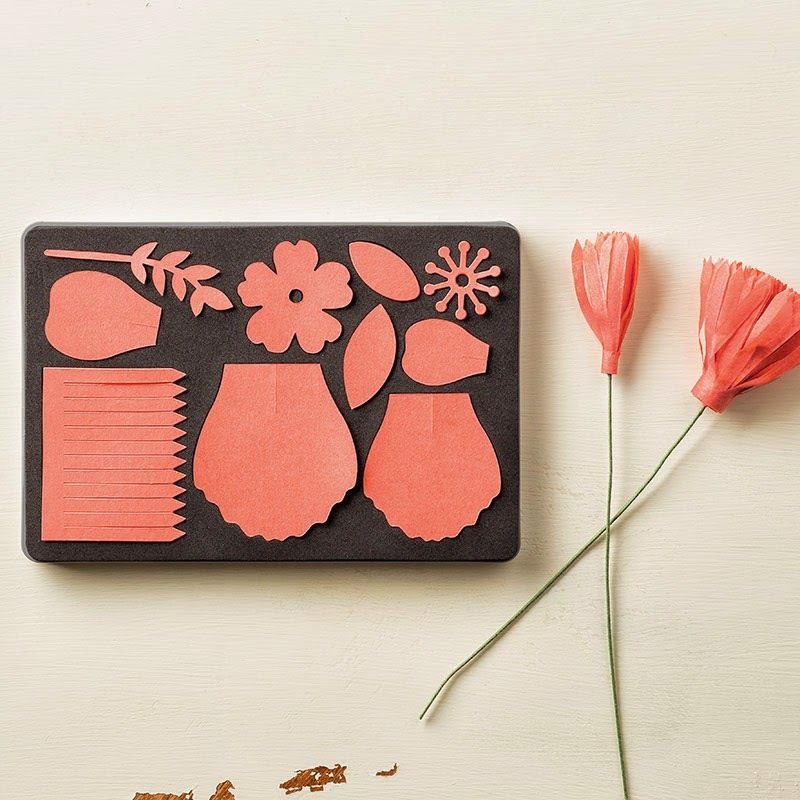 Create your own spring bouquet at any time of the year with this die. Use with Big Shot and Standard Cutting Pads. Largest image 5" x 2-1/2" (12.7 x 6.4 cm). Let me know if you would like to add this die to your next order. This great new Angel Policy set is just what you need to help you in your business when you sell your cards or cupcakes or knitting etc. I love the little snail for my envelopes (Can't beat Snail Mail). Yes it is on my list this week. Recommended clear block sizes are A, B, D, G (not included in the set). Our photopolymer stamps offer a versatile all-clear stamping option. You'll find that our photopolymer is top-quality and gives a perfectly stamped image every time. The stamps stick amazingly well to our clear blocks and are easy to place just where you want them. And best of all, you get to enjoy tons of images for a great price! 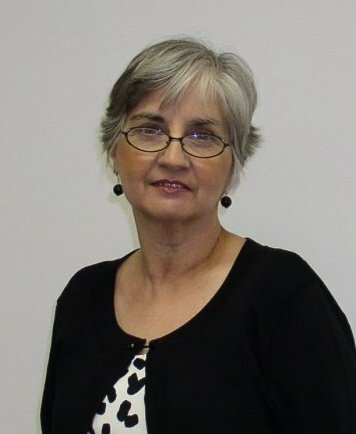 Labels: Better Than E-Mail, Frances Wagner, Photopolymer Stamps, Stampin' Up! Did you like the Bow Builder Big Shot Die? Then you will love this same design but smaller in a punch. Quick and easy and you will love it too. Let me know if you want to add this to your order. Don't you love love love this Mini Treat Bag? I love it. Such a perfect size to put in a card or to add a treat to. Our biggest sales event of the year isn’t just about sales—it’s about rewards, too! 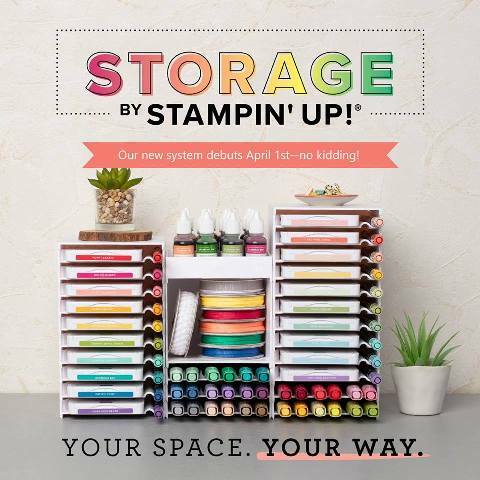 Earn free products when you shop, join as a demonstrator, or host a Stampin’ Up! party! It’s simple—one free product for every $50 you spend (before tax and shipping). Get those products you’ve been wanting, and earn more for free at the same time! 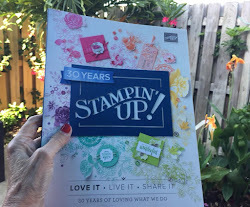 Earn $25 more to spend on any Stampin’ Up! products with a qualifying party! Contact me today to book your party for more free stuff! We all love FREE stuff. Thanks for stopping by! 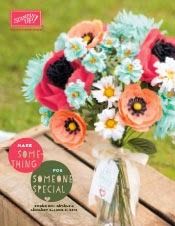 SAB and Occasions catalogs go live on Tuesday. I know you can't wait to get your favorite item. I was able to pre-order from these catalogs in December (one of the SU Demo Perks) and I am having so much fun. Here are a few quick samples along with upcoming classes. Don't you just love this new Mini Treat Bag Thinlits Die? I do and can't wait to make cards with you. 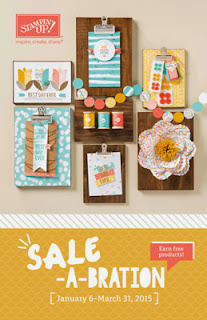 We will be using 2 FREE SETS from the Sale a Bration catalog. If you have not gotten yours yet contact me. I saw a card close to this on Pinterest and decided to share the idea with you. Contact me today to sign up for this class. 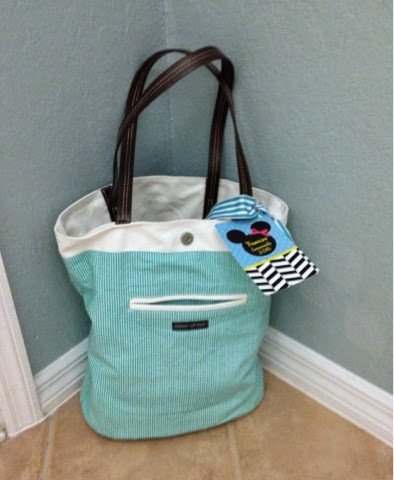 You will make 5 projects - cards and boxes/bags. Here is a sneak peek of one of our projects. More upcoming samples for classes to come. Stay tuned. Sign up today.